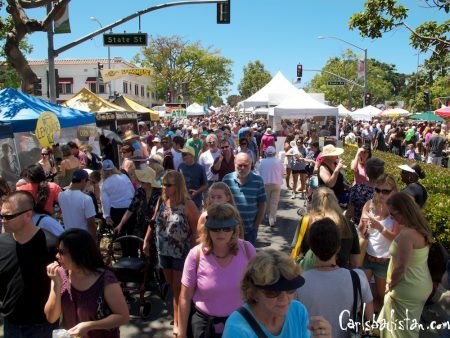 The Carlsbad Village Faire, hosted by the Carlsbad Chamber of Commerce, is returning to the Village May 6th. The streets will come alive with the sights and smells of fair-time as 800 vendors set up unique booths, fairgoers search for handmade gifts, try mouthwatering foods, and have some fun in the sun. The fair draws over 100,000 visitors with its 800 unique vendor booths offering handcrafted arts and gifts, antiques, jewelry, unique clothing, home décor, plants and more. The international food court will once again feature more than 50 booths serving everything from Thai to Hawaiian cuisine. The children’s area will entertain youngsters with games, a super slide, a bounce house, a rock climbing wall, and face painting. To make parking more convenient, complimentary shuttles will run to and from the fair. Shuttles will pick up and drop off passengers at the Poinsettia Coaster Station and the west corner of Sears at The Shoppes at Carlsbad. Additional handicapped parking available at the Carlsbad Visitor Center (the old train depot), 400 Carlsbad Village Drive and at the Village Faire Shopping Center, 300 Carlsbad Village Drive. For more information about the Carlsbad Village Faire, please contact the Carlsbad Chamber of Commerce at (760) 931-8400.